Today for your thrifty arting pleasure we have 41 tips for juice boxes, elastic bands and gift bags PLUS a terrific gift bag project with instructions. Yesterday, I went back to do a count on how many art tips have been published since I started the blog. I thought I had made an adding mistake (math has never been my strong point ;) when I saw the number....267. I added it up again and sure enough it was correct. Of course this doesn't cover all of the tips that were submitted in the recycling contest, remembering that there were duplicate tips in most of the lists and there are still some to come. But anyway you look at it... that is one awesome number! Thanks to Terry Howard, Martha B., Leslie, Donna Zamora, Susan Marie, Kelsey Jones Evans, Stephen du Toit, Moon Willow, Christine Bell, Pam Yee, Pam Crawford, Donna Hall, Elizabeth from Kansas, Alicia Edwards and some from yours truly for submitting these great tips! Please take a moment to say thanks to them for their generosity when you visit their blogs or come across their name in the various art groups on the web. Thanks too to all those folks who have written me an email about the tips, posted a thank you in one of the art groups, left a comment on the blog. I try to answer all the emails and comments, if I have an address, to personally thank those folks who have taken the time to write. I sincerely appreciate each and every one of you and am just tickled when I get an email from a blog viewer! 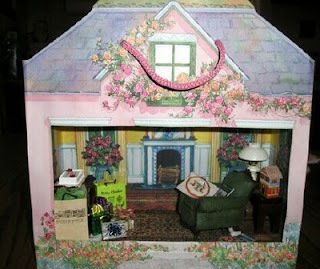 Add a chipboard roof to create a little house/birdhouse. Make shaker boxes. Cut the top off of one juice box. Cut an second juice box to make a lid for the first juice box. Fill the juice box with beans. Push the lid on top of the first juice box. Put tape around it to seal it and decorate the box. Use an altered juice box on a belt as a rather unique embellishment. Cut off the top on three sides leaving one side for a hinge, rinse them and use for storage of small items. Use juice box straws as arms and legs on stick figures. The accordion part of the straw makes great joints. Fill with plaster, then decorate as building blocks for children or to use in a shrine. Cut off the top of a juice box on 3 sides add a latch and you have a little treasure keeper or gift box. Cut off the top, wash thoroughly, then decorate to use as favor holders for parties. Staple them into your art as a great embellishment. Use them to hold things in place as the glue dries. Use them to hold overstuffed notebooks closed. Use them to create a closure for note card booklets or handmade books. Cover them with a fabric tube and use as hair scrunchies that don’t pull your hair. Save those elastic bands and make a huge "stress" ball … slowly… one elastic band at a time! To create an interesting design…. wind one around a brayer, then run the brayer over ink pad or acrylic paint spread on a flat palette. Wrap elastic bands around a wooden block, randomly or in a design, to make your own unique rubber stamp. Save those elastic bands to bind a book. Wrap WAXED PAPER, FOIL, TP ROLLS with rubber bands or yarn to make printing tools. Save those elastic bands and use in collage. Alicia said: "I once saw an octopus made out of elastic bands. It was awesome." Use for instant covers; the handles are great for closures, elements for theme pieces. Cut gift bags up for backgrounds on cards, collage, ATCs, art journals, covers and ABs. Sit on a shelf as pretty storage for bulky art items. Don't forget to attach a 'gift tag label' so you know what's inside. Cut them up to use as you would any paper stock. Save those gift bags, alter and keep them on hand for the next gift-giving event. Add your own embellishments and reuse them as gift bags. Re-art them for someone special. Tear them apart and use the pieces in paper mache for book covers. The color is great! 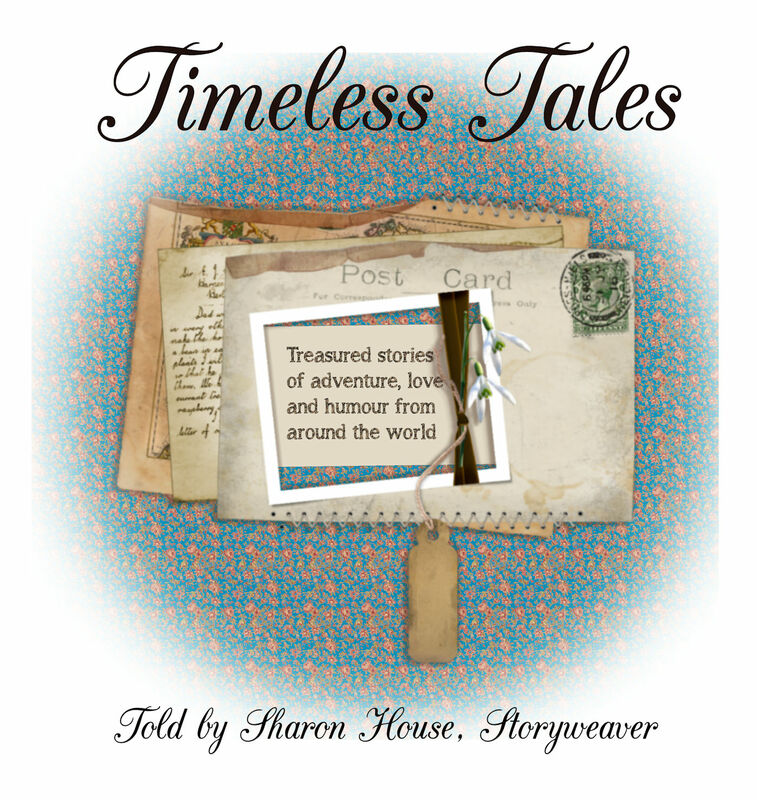 Use the designs in collage, altered book or a pop up book. Save the cord handles to bind a book. Here’s an idea for gifts bags that I just love! You don’t want to miss this one…. 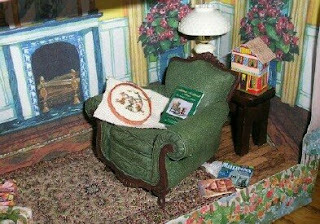 Create a miniature scene in a gift bag. Imagine a little Christmas scene for someone special. What an awesome gift it would make! 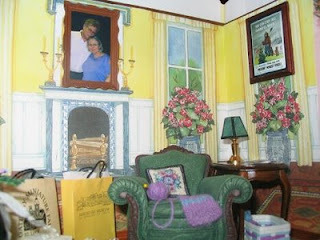 Fay Zerbollo of St. Louis, MO makes absolutely fabulous “gift bag room boxes”. I got in touch with Fay last week and she graciously agreed to allow me to post a few of the photos of her gift bags to whet your appetite and tantalize your soul until you can make one of your very own . To get a copy of Fay’s “how to” instructions click here. Even if you aren't ready to take on another project right now, drop by Fay’s site to see all of her wonderful creations and get inspired. You’ll be glad you took the time to browse through her site. She is truly a master artist when it comes to assembling these wonderful gift bags. Have a fun Halloween week... Time permitting, I will see you on Friday with a spooky story! I love these tips and ideas! Now I will probably never toss out a thing again. Many thanks! Wisdom Tale - The Eight Cow Wife!